The What: Séura is adding an 84-inch model to its flagship outdoor television line, Séura Storm Ultra Bright. The ultra-high definition (4K UHD) television is intended for outdoor use, even in direct sunlight and all weather conditions. Despite their 25 square foot screen area, Séura Storm Ultra Bright 84-inch televisions are a mere 3.7 inches in depth. This allows the TV to be incorporated into a wide variety of outdoor spaces. The Séura Storm Ultra Bright is designed to fit applications where projector screens, previously used for displaying outdoor video in large formats, are inappropriate due to natural lighting conditions that degrade picture quality. The 84-inch Séura screen features ultra-bright 600-nit performance as well as a proprietary anti-glare screen coating. The Séura units are resistant to rain and snow, and are designed to operate in temperatures ranging from -22 degrees to 140 degrees. The Bottom Line: The 84-inch Storm Ultra Bright is the direct-sunlight companion to the 84-inch Séura Storm television, which is designed for outdoor shaded areas. 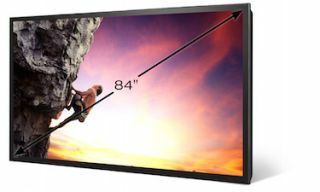 Deliveries of both versions of 84-inch screens are expected in summer 2016 with Storm Ultra Bright at $19,499 MSLP and the Storm at $14,999 MSLP. To pre-order Séura 84-inch televisions, visit shop.seura.com or call (920) 857-9069.